Undergraduate and graduate students were recognized for excellence in research posters and presentations. 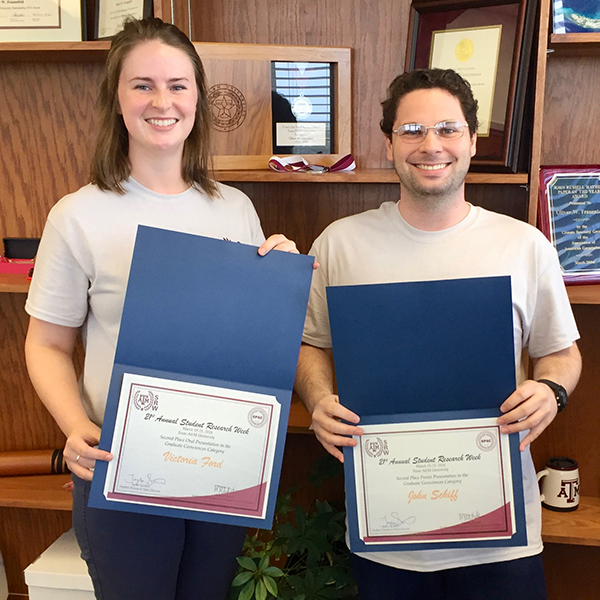 Student Research Week 2018 was held March 19-23 at Texas A&M University, and several students from the College of Geosciences were recognized with awards. Both undergraduate and graduate students competed in poster and oral presentation competition categories. 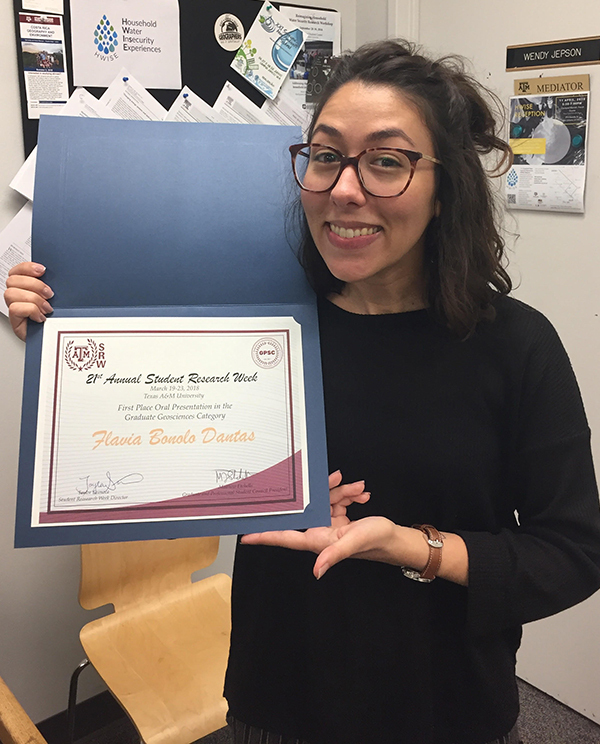 Lumberas received this $500 award, which honors the best emergent research in the area of diversity and inclusion issues in higher education. It is designed to raise awareness and advance research on diversity and inclusion issues in higher education (accountability, campus climate, equity, policy, programming, services, role of technology, student development, etc.). Lumberas is also a member of the Texas A&M Corps of Cadets. He noted that Josh Fiedler '17 and Ty Crawford '18 also assisted in collecting the data for the project. 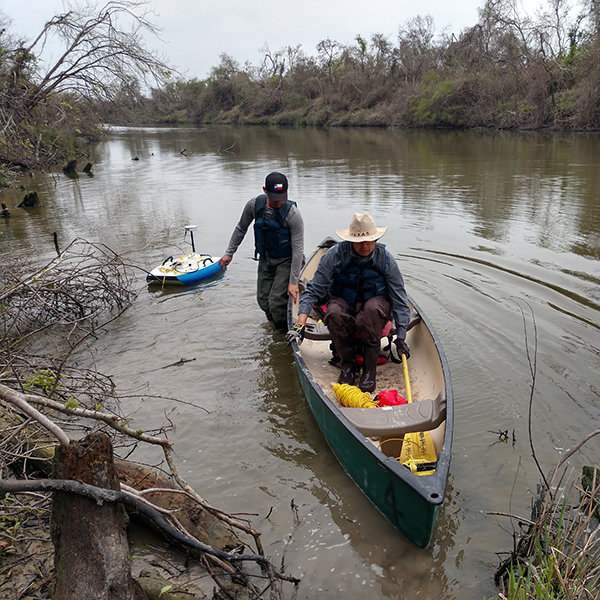 “I plan to graduate in Fall 2018, and my post-graduation plans include pursuing a post-doctoral or permanent position within a government or non-governmental organization that focuses on environmental science and management,” Castillo said. Schiff plans to graduate in May 2019 and then pursue public policy fellowships. After completing her PhD in 2021, she plans to continue doing research on water security from a political ecology perspective. “Most importantly, I wish that my work will contribute to a more just and equal division of burdens from environmental degradation and exploitation,” she said. Ford plans to complete her PhD in Spring 2020 and then work in the public sector. Connally’s project involved the creation of an app, named TRAIL TREK. 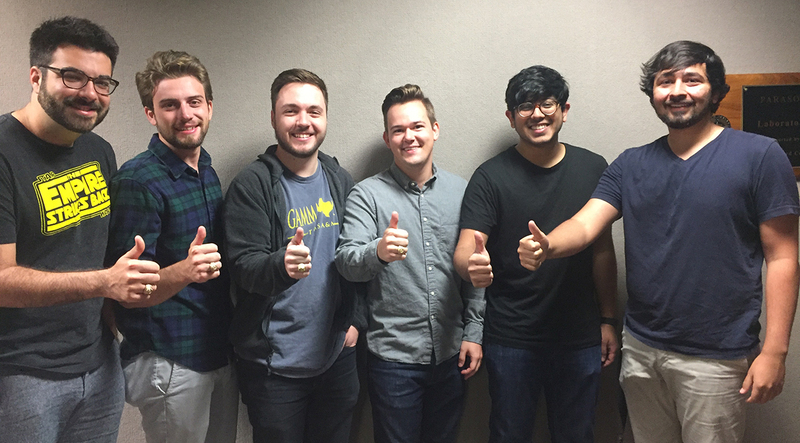 A team of six senior Department of Computer Science and Engineering students worked on its development, and Connally said he and all of his teammates will be entering the software development field upon graduation. “I am extremely excited about the potential of this project and I am so proud of what the team has accomplished already,” Hammond said. 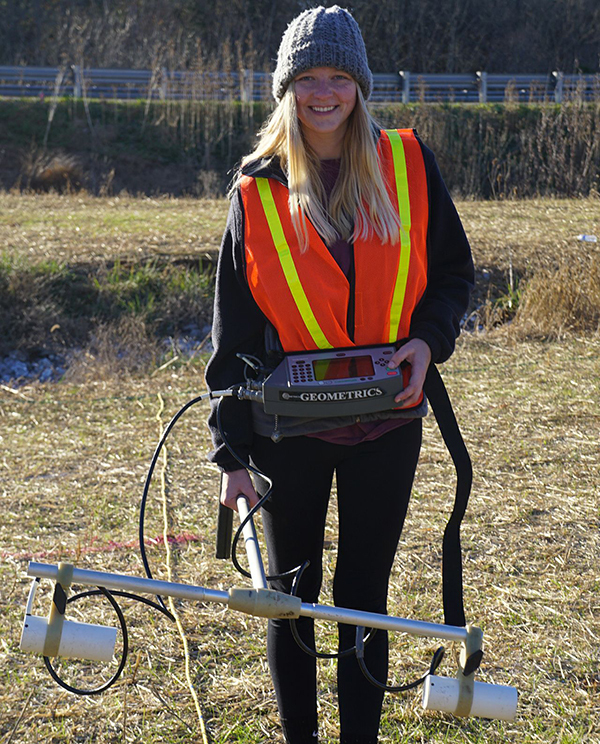 Title: Detection of Buried Anomalies Using Magnetics in Lexington, VA.
Martin's research projectwas funded by the Geosciences Dean's Office High Impact Learning Experiences Program. "This wouldn't have been possible without the fantastic support of the college," Martin said. The second author of the project poster and presentation was geophysics undergraduate student Bassam Alzayer, she said. Martin's work on this research also recently won in the Department of Geology and Geophysics' Student Research Symposium poster contest, undergraduate division. "Though it is my junior year, I'm graduating a year early this May 2018. I have accepted a position as an environmental geologist in Houston," she said.